I remember what it was like to write my first Chinese characters. It felt like writing runes with magical powers, they were exotic and beautiful, closer to art than language. I still like Chinese characters, so studying Chinese for years hasn’t destroyed that feeling completely. Still, I have to admit that I don’t find writing characters by hand very fun in and of itself. I prefer typing and reading. If you love writing Chinese characters by hand, this article is not for you, but if you feel that you want to learn to write Chinese characters, but that you don’t want to spend more time than necessary, you’ve come to the right place! 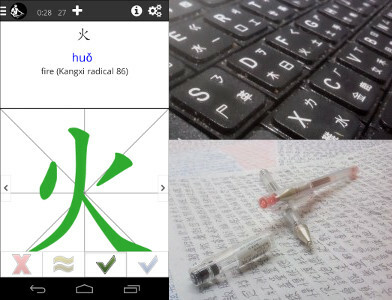 In this article, I will discuss my minimum effort approach to handwritten Chinese. I have already talked a lot about how to learn characters elsewhere, so this is more about the bigger picture. If you want to read more about character learning in general, this article offers a good overview: My best advice on learning Chinese characters. Before I go into any details about the strategy itself, there are a few words to be said about the goal. My goal is to be able to write most things by hand that I can already type on a computer. That means that vocabulary, grammar and so on isn’t part of what I’m talking about here. This is about the difference between being able to read, type and perhaps say something, and being able to write it down on a piece of paper by hand. Why would you need to be able to do that? There are many reasons, but personally, I think that not being able to write the language you are learning is a serious deficit. How serious it is depends on why you’re learning. Your friends finding out that you can’t write is one thing, but it will be harder to convince native speakers that your Chinese is good if you struggle with filling in a simple form during a job interview. I have written more about the importance of handwriting here: Is it necessary to learn to write Chinese characters by hand? I don’t care about writing beautifully. That clearly doesn’t fit into a minimum effort approach. I don’t need to be able to write quickly. This is also a minimum effort consideration, I merely want to be able to write, even if it takes a little time. Reading ought to be the start of any endeavour to be able to write. Passive understanding of something is the foundation for active knowledge and without it, it’s hard to get a feel for how the language is used. Constantly looking at Chinese characters also teaches you what they look like and which characters belong together. You will not learn to write all characters by hand simply by looking at them, but reading is still the foundation of writing. Typing keeps your vocabulary and grammar up to par. Typing basically includes everything that handwriting does, minus moving a pencil across paper by hand. This means that if you can type something, you generally only need character knowledge to be able to write it by hand as well. If you use phonetic input (such as Pinyin or Zhuyin), you also make sure that you know how to pronounce what you’re typing, which increases the chance that phonetic components will remind you of how to write the characters as well. Spaced repetition software is crucial for any minimum effort approach because it’s by far the most efficient way of maintaining large amounts of knowledge. These programs will help you schedule each review, putting it off for as long as possible to save you time while not delaying it so long that you forget the information. It’s possible to build a large vocabulary this way with less effort than most other methods. I prefer Skritter because it gives me immediate feedback, but you can use any program. Communicative writing refers to writing Chinese characters with real communication in mind. Most of the practice that takes place in classrooms is not communicative (such as translating sentences, doing exercises in the workbook or dictation). For writing to be communicative, communication needs to be the main purpose of writing. It can be with other people, such as leaving a note for a friend written in Chinese or chatting with someone online using the handwriting input on your phone, but it could also be with yourself, such as writing shopping lists, memos or blog posts in Chinese. The point with communicative writing is that it’s realistic and makes sure you constantly drill the high-frequency words you need to be able to write well. If you neglect this step, you will likely find that you forget even common characters when forced to write by hand, simply because you never write them and spaced repetition software isn’t very good at spotting weaknesses in knowledge you’re supposed to know really well. By combining these four elements, its possible to reach the goal of being to write by hand most things I can already type on a computer. I haven’t found a way of removing any of these components, so this is why I call it a minimum-effort approach. This strategy is the result of a lot of thinking about how to learn what I need without spending too much time. I have used a similar approach for a few years and it has served me well. I can write Chinese when required to and I seldom forget characters or words. I don’t spend much time focusing on only writing characters, it’s all integrated into other activities that are either communicative or meaningful in other ways. Even if my typed Chinese is superior to my handwriting, that’s mostly because of differences between word processing and handwriting in general, such as speed, ease of editing and so on. This is at least partly applicable to any language, so I would find it harder to write this article by hand than typing it in a text editor. Thus, I still prefer typing Chinese, but I’m not really afraid of writing by hand. The only drawback is that when required to write something lengthy, the muscles in the hand aren’t really up to the task and get tired easy, but I can live with that. What strategy do you use to learn to write by hand? Are you like me in that you want to learn it, but not more than necessary, or do you genuinely enjoy writing characters by hand? I often see signs or texts I can’t quite read. So I take a picture to decipher them later. I create a note on Evernote, insert the photo, and write what I see. Pleco is the easy way to write as it’s forgiving with stroke order and time, but my phone’s Chinese writing input tool is more challenging. On Android I use Google Pinyin, which (as its name doesn’t say) allows drawing input. It’s faster and puts more pressure on me, since I have to write fast and more like a native writer. Later I look up the words on Pleco or input the text into Google Translation or whatever, but I’m finding it’s good practice to write what I see in this way. Futzing with OCR often doesn’t work well for me anyway. Copying bits of text also lets me practice writing in context, unlike SRS systems characters or words are practiced in isolation. 1. I don’t care about writing beautifully. 2. I don’t need to be able to write quickly. I merely want to be able to write, even if it takes a little time. Alright. Firstly, is there a such thing as a minimum approach to writing? You either learn it or you don’t. The first stipulation suffices. But the second doesn’t. If you are having to bust your brain just to write down a sentence, it will be used as proof that you are not proficient in the language you are writing. You may “prove” that you can write, but it will be like that illiterate person who just learned the alphabet, and has to jog his brain just to write down a simple collection of words. If you wan’t a minimal approach to writing, then don’t even bother to learn it. That’s the only realistic minimal approach that exists. Otherwise it is a full out effort. Don’t hoodwink learners of this language. Speed is definitely important. You aren’t going to do anything useful with writing if you are writing at a snails speed. You’ll have forgotten everything you were writing by the time you finish the first sentence. It should come as no surprise that I don’t agree, but let’s see if I can explain why! First, writing Chinese by hand is not a binary skill as you imply. There’s a whole range of possible states from “barely being able to communicate basic things in writing” to “Chinese native speaker who just finished high school”. As a teacher, I’m happy if I can recall 95% of the 5000 most common characters or so, even if it takes some time to recall. After finishing my master’s program, no-one has required me to write a lot. I still could, but it would be slow. I think this is acceptable and it’s not about hoodwinking anyone, this is how I study myself. If I aspired to write as quickly as someone who just finished high school, I would need to spend several hours per day on just handwriting and would still fall short. This is why this is a minimum approach. I also think that learning to write let’s say 500-1000 characters by hand is good for character understanding and vocabulary retention, even if reading is your ultimate goal rather than handwriting. So I (almost) never recommend students to skip handwriting altogether. In general, there are many different ways of learning and maintaining the ability to write by hand in Chinese and this article presents my own way of reaching my goals while spending as little time as possible. It might not be the right for you, of course, especially if you don’t share the same goals as I do!